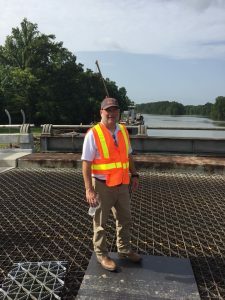 About one year ago, David Miller was promoted to the Chief Maintenance Engineer position at the Louisiana DOTD (LaDOTD). Before that he served for several years as the Bridge Maintenance Engineer for the State. David is happy his new position gives him the opportunity to remain involved with the bridge program and he can take preservation issues further. Some of the longest bridges in the United States are located in Louisiana. With 175,000,000 square foot of deck area (2016 FHWA data), Louisiana ranks as the fourth largest state for bridge deck area. It follows Texas, California and Florida, which all have a higher number of bridges than Louisiana. In addition to having long bridges that span over the Mississippi and across marshlands, Louisiana has also a large number of timber bridges (third most in the US), which were built years ago during the expansion of local timber industry. What does bridge preservation entail at LaDOTD? Bridge preservation can be divided in two parts in Louisiana. One part entails larger preservation projects that are managed through the bridge preservation program that has been in place for about 10 years. It is part of the overall bridge replacement, bridge rehabilitation capital program and allocates from $30 to $40 M per year specifically for bridge preservation projects. Projects are selected through a committee that takes input from the districts and are back checked with deterioration models from Pontis in the past, AASHTO BrIM currently. This part is where the heavy lifting on the preservation side comes in. The other part is funded through the operating side of the budget. This entails maintenance and preservation activities that are done by districts’ bridge crews and statewide crews. Unfortunately, our crews tend to do more emergency-related work than preventative maintenance because many bridges in Louisiana are in poor condition. (In 2016, LaDOTD reported 1,739 structural deficient bridges, corresponding to 13.5% of 12,915 total number bridges. Ed. Note). Our crews also focus on preserving our timber bridges to keep them open and safe. What is your bridge preservation strategy? Our strategy at LaDOTD is to improve the condition of bridges and their ratings every time it is possible. For example, if a paint project is scheduled for a particular bridge, we do not necessarily want to do the painting only. We evaluate whether there is a structural rehabilitation project that can be done in parallel to painting to improve the overall rating of the bridge. A pure painting project does not move the rating of a bridge from poor to good. The majority of our preservation activities have been focused on bridges that are in poor conditions. Our goal is to bring these bridges from poor to fair or from poor to good. Mainly because of lack of funds, we are not at the point that we can do activities on bridges that are in good condition, which is the recommended preservation approach. Our gas tax, 16 cents per gallon, was implemented in the 80s and has not changed, or been indexed, since then. We recently went through an effort with our Legislators to try to increase the tax in order to have more funds to maintain bridge and road assets. Unfortunately, this effort failed to pass. This will make our responsibilities in maintenance difficult to carry out as we continue to deal with our relatively large number of posted and structurally deficient bridges. It will take additional funds to be able to get ahead of the curve and do more of strategic preservation activities on our bridges. Four of the top five longest bridges in the United States are in Louisiana. Most of these bridges belong to the interstate system and are in good shape. However, having to deal with long bridges puts an additional strain on our resources. Preserving a bridge that is 20-miles long and has a twin structure requires a lot of money. A tremendous amount of money is required just to tackle one element of the bridge, for instance the deck. What is the LaDOTD strategy with structurally deficient bridges? We have prioritized work on structurally deficient and posted bridges that are on the major truck routes. We are also planning to replace all our timber bridges. This poses a challenge as we have the third most timber bridges in the country. Most of these bridges, which were built in the 50’s and 60’s, are deteriorated beyond their service life. What are the challenges in the implementation of your preservation strategy? As I said before, the biggest challenge for us is funding. Our administration understands the need for additional funding for highway infrastructure, so hopefully there will be additional funding in the future. Probably the biggest success story is just the fact that LaDOTD has a bridge preservation program that has been in place for 10 years. There have been some major projects completed through this program. One of these was the rehabilitation of Huey P. Long – O.K. Allen Bridge crossing the Mississippi in Baton Rouge. This is a steel truss bridge over a mile long. It is a both a railroad and highway bridge, the only bridge of this kind owned by the state. It was brought to fair condition through a rehab project that entailed structural repairs with member strengthening and painting. It was a typical preservation-style project even though it was necessary to use more than the normal preservation funds. Is TSP2 helping LaDOTD reach your goals? And how? TSP2 provides a very valuable forum for networking with peers from other states and federal agencies. During the annual South-East Bridge Preservation Partnership (SEBPP) meeting, we get the opportunity share knowledge, success stories and failures. We can learn from states that are ahead in certain areas of bridge preservation. We can also learn their preservation strategies and how they were successful in getting funding increases for their department. TSP2 is definitively a big plus for us. I would suggest improving the liaison between TSP2 and the Sub-Committee on Maintenance (SCOM), specifically in relation to the flow of research projects. We streamlined this process at SCOM about two years ago (David is Vice Chair on the SCOM Bridge TWG for Asset Management, Performance Measures and Environment. Ed. Note) and now it is TSP2 that is addressing this process. There is the need for fine-tuning research needs between SCOM and TSP2. There is definitively room for improvement in this aspect of the collaboration. TSP2 is now sending representatives from its four regions to SCOM. This really helps with creating continuity between SCOM and TSP2. For example, at SCOM we recently learned from the North-West TSP2 Region about the benefits of bridge washing and how to get through the process with environmental groups. That would have never happened had the North-West Bridge Preservation Partnership (NWBPP) not sent representatives to SCOM. In general, the more time SCOM and TSP2 people meet and have discussions the better they will be able to get on the same page. Flow of information between SCOM and TSP2 is improving, but it could get better.